Members of Coldstream Mens Shed who designed, built and installed the bench they are sat on. Coldstream’s war memorial gardens have been enhanced by two newly installed seating areas. The local Honour Our Troops branch has been working on rejuvenating the town war memorial gardens at the entrance to Home Park behind the war memorial on the High Street since 2014 as part of their Poppy Project 2014-18. Poppy Bench donated by Coldstream In Bloom and the Gateway Association and installed by Scottish Borders Council. Volunteers from other organisations in the town got on board a year later, as did Scottish Borders Council and now things are really taking off. Coldstream Community Trust volunteers mow the grass regularly, they have created two rockeries over old tree stumps using stone from Lennel Kirk and carry out regular garden maintenance. Coldstream Men’s Shed got on board last year and have built a sturdy bench around one of the trees where people can now sit and reflect at Remembrance services and other times. And the Coldstream in Bloom team from Coldstream Gateway Association contributed a poppy bench. One of the Honour Our Troops organisers, Annemarie McCall said: “All of this was possible through grant funding from Hudson Hirsel and the Co-operative Society. “The last part of the rejuvenation is installing lighting in the gardens so residents and visitors can feel safe when they walk through at night. 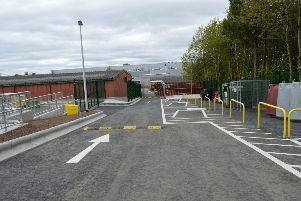 We are in talks with Scottish Borders Council as to how this safety aspect can be solved. “We are over the moon that through the commitment, dedication and work of everyone involved the memorial gardens are quickly becoming a place to sit and enjoy rather than just a walkway linking the High Street and the park. “We are slowly returning them back to being a place of peace and contemplation, in line with why they were first instigated so many years ago for mothers and wives who had lost their sons and husbands during World War One.